PURSUING FREQUENCY: Pursuits is likely increasing frequency next year. The move is surprising. When the title was launched in January, it did not seem clear who would read Pursuits that Bloomberg hadn’t already reached with its other magazines, including Pursuits’ sister monthly title Bloomberg Markets and Businessweek. Pursuits was created to cater to Markets’ readers while they’re at play. “We have had this remarkable audience. We wanted to give them more lifestyle edits. We are reaching among the richest, wealthiest people in the world, who are relatively young. And we’re doing it with a luxury lifestyle magazine,” said Dukmejian. The magazine is sent only to subscribers of Bloomberg’s famed terminals, who pay some $20,000 for the so-called Professional Service. That’s an audience of 375,000 readers who have an average age of 44 and whose average annual household income is $490,000. An additional demographic note: 90 percent of them are men, Dukmejian said. Another distinguishing characteristic from its award-winning, corporate siblings is content. For its readers, Pursuits lays out an exclusive buffet of subjects: “yachting adventures in the Atlantic, jewelry in London, exotic cars in New York, resorts in Laos, and more,” according to Dukmejian’s letter in the premiere issue in February. “This world is one where other magazines don’t have access,” said Markets editor Ron Henkoff. In the first issue, there was also a fashion story featuring terminal customers modeling new slim-fitted suits. That’s going to be expanded in the second issue, out in October, and the magazine has also tapped former DNR editor in chief John Birmingham as a fashion consultant. While Businessweek has lured feature writers from the New York Observer (Felix Gillette) and The New York Times (Ashlee Vance), among others, Pursuits relies on the lesser-known Bloomberg News reporters who are scattered all over the world, like Jason Harper, who writes weekly exotic car reviews, and Aaron Kuriloff, who covers yachts and sailing. Dukmejian said that management will give the green light on the quarterly frequency because “the momentum is positive, on the reader side and the advertising side." Bloomberg would not be alone in banking on luxury titles. Reuters has now passed out its new magazine, launched in January, twice at confabs that attract business leaders and potentates, the World Economic Forum’s annual conference in Davos and the Aspen Ideas Festival. Time Inc. relaunched Time Style & Design, and this September, Binn Group will launch Du Jour, aimed at readers who have a net worth of $5 million. But while luxury advertisers are eager to spend, it’s less clear that they want to do so in print magazines: The Robb Report has lost 7 percent of ad pages year to year, and Town & Country is flat, according to Media Industry Newsletter. Meanwhile, Anthony Cenname, the publisher of The Wall Street Journal’s WSJ. magazine, says advertising at his magazine is flourishing — although it’s not clear at what rates. Du Jour has not yet closed its September issue, and MIN hasn’t begun tracking Style & Design. Though Dukmejian does not yet know how many ad pages the October issue of Pursuits will have, he said 60 percent of the advertisers from the first issue are returning; he declined to reveal the names of the return advertisers. For him, to double the premiere issue’s 30 ad pages would be “a home run.” But 40 pages would still be considered a successful benchmark. 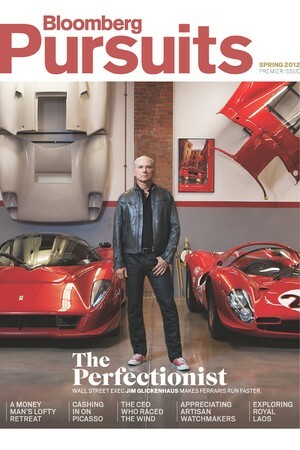 If the magazine goes quarterly, Dukmejian said Pursuits will ask for a small dedicated staff — at the moment, Markets’ 60-person team handles all aspects of the lifestyle magazine.